It's National Bike to School Day (May 9, 2018). 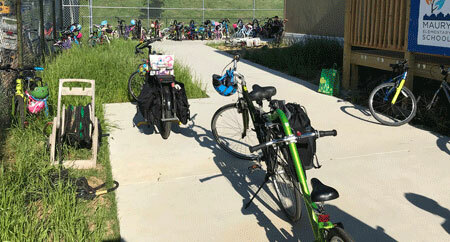 With more than 2,100 schools registered to participate this year, that’s a lot of kids bringing their bikes to school. And it's awesome that kids are deciding to ride their bikes and the effort schools are putting in to encourage this transportation choice. All-around this is a tremendous event with the long-term goal of encouraging students to bike or walk to school year-round as it promotes healthier, happier students, along with a variety of other benefits. But we’ve noticed a problem. 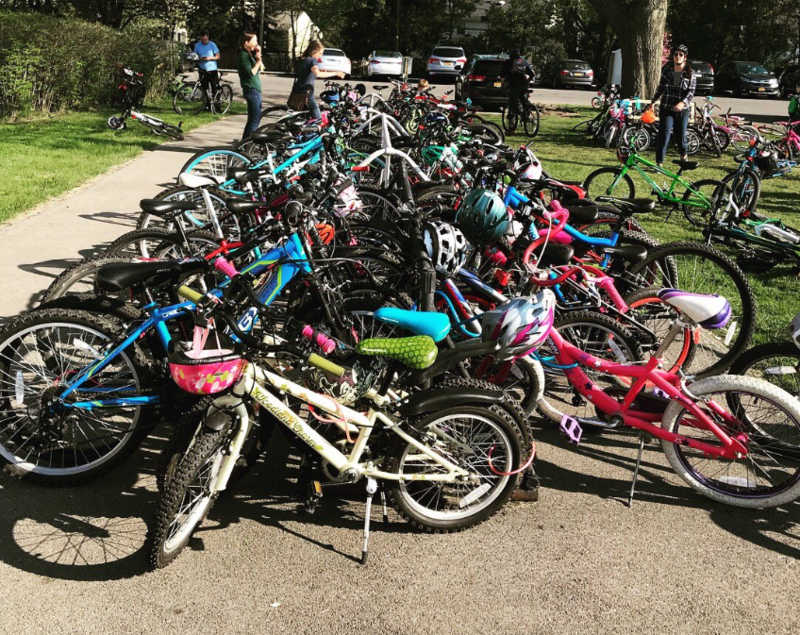 It appears that many of the schools we’ve seen promoting their bike-to-school events are not considering one of the key building blocks to will help foster a sustained, bike-friendly environment – bike parking. Once these 10s, 100s or even 1,000s of kids who take to their bikes get to school, they will more likely than not have to park their bike in a grid-style bike rack – a common choice among schools because of the price and familiarity. However, these bike racks pose several problems that could cause bad experiences and deter students from using a bike to commute in the future. After a student has navigated parked and moving cars, driven their bike through crowds of students on their route and arrived at school, the last thing they should have to deal with is fighting a herd of other bike riders to park their bike. 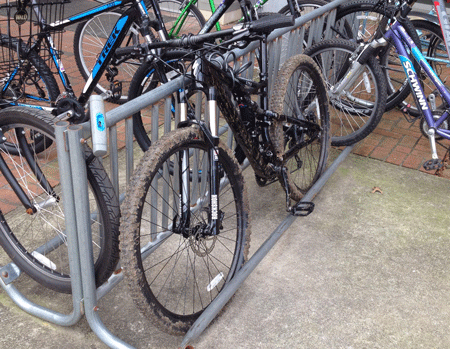 The bike parking spaces of grid style bike racks are usually too close together. This forces riders to almost be on top of each other and physically be in the way of other riders trying to park their bike. This situation is usually compounded after school is let out as kids all spill out at the same time. Multiple students are all in the same condensed area, at the same time, trying to access and unlock their bike, so they can head off to the afternoon’s activity. 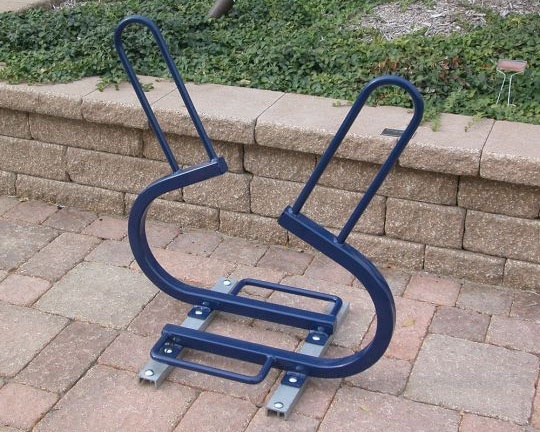 A bike rack should support locking the frame and at least one wheel using a U-lock. Typical grid bike racks are limited by allowing only the wheel OR the frame to be locked. Wheels can easily be removed on most bikes, making it easier to steal a wheel or the bike frame and unlocked wheel if it is not properly locked. A good bike rack will support an upright bicycle by its frame at two points. This prevents the bicycle from tipping over. The grid bike rack typically only supports the front wheel. This commonly results in the wheel turning, causing the bike to tip over. The issue with bikes that tip over or fall is they can cause damage to the frame or other components of the that and other bikes. Damaged components can lead to a bike not functioning properly and could be costly to repair. Scratches, in addition to their unsightly appearance, also expose the bike to rusting and eventually result in weakening of the frame where it no longer can support or be safe for the rider. One way many riders properly lock their bike and keep it from tipping over on grid parking racks will be to park their bike along the bike rack. This significantly limits the number of parking spots for bikes. When there aren’t enough racks to park all the bikes, riders get creative and will lock their bike to anything seemingly permanent – including trees, benches, fences, sign posts and more. Besides cluttering the aesthetics of your school, it can cause other issues in the way of safety and damage to property. The typical handlebar is 24" wide. The spacing for grid bike racks is usually narrower than this. As bikes are pushed into and pulled out of these racks, hand brakes, bells, lights, as well as the handlebar itself can rub and damage other bikes. Handlebar conflicts can also cause scrapes, cuts and bruises to rider’s hands as multiple riders are attempting to park or remove their bikes at the same time. 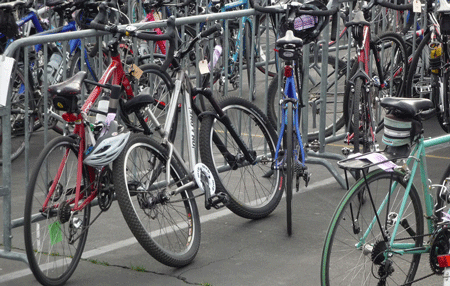 U-rack bike racks are popular choices for school bike parking solutions because of their affordability and utility. When there are a lot of bikes that need to be parked and not a lot of space to put them, double-sided bike racks offer the necessary bike parking spots, with easy access, in a minimal footprint. Another way to accommodate a large number of bike parking spots into a compact space while avoiding the issue of handlebar conflict is with a bike rack that has the front wheel wells at staggered heights. These are just a few of the many elements that factor into determining the best bike rack for your school. Other items worth considering are the number of bike parking spaces needed, available space for bike parking, finishes and more. National Bike to School day is one of the most effective programs to get kids on their way to becoming a life-long biker. But to make the day a success and encourage kids to ride their bikes to school year-round, it’s important for schools to support these efforts with an all-around, positive experience. And bike parking is a big component of a good biking experience. Lack of spaces to park your bike, having your bike damaged or stolen and being injured will all be deterrents to having kids choose to ride their bike to school. 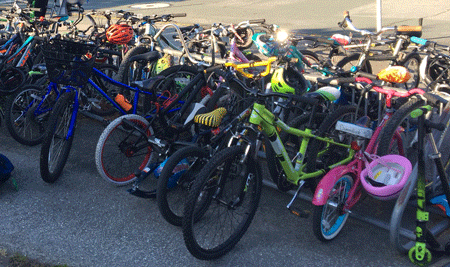 Encouraging students to ride their bikes to school is good. Having the infrastructure to support their choices is even better. If there are kids that bike to school or at your university, good bike parking is going to be on their minds and should be on yours too. 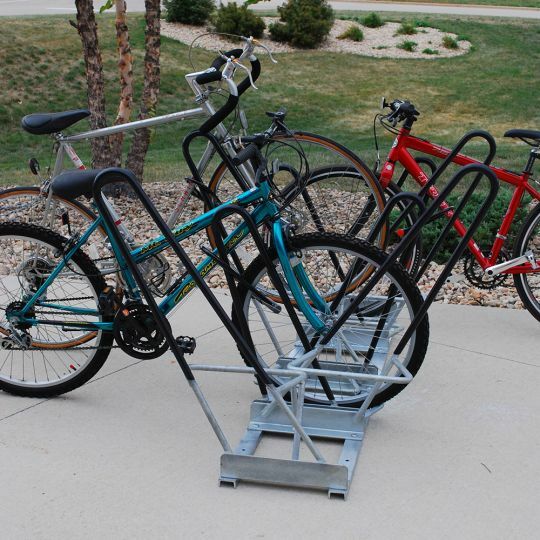 Check out the latest selection of bike parking racks.